My alarm is set for 5:00AM, but I wake up at 4:30AM, so decide to get up and start my journey early down to Monmouth to the line of totality. The traffic on the road is quite heavy but it moves well, so the trip takes me just under an hour. After I arrive in Monmouth, there is a bit of confusion about our meeting point, but after a phone call to check-in with my two observing buddies I meet them on the astroturf field they have picked out for us. We are setting up at 6:45AM, before the staff at Western Oregon University are ready for us, but they are happy to have us there, so we get prime parking spots by the entrance to the field. Six more of my group from Victoria show up at the same location to observe the eclipse together, which is a lot of fun. I take some video of the people on the field as well as our group to capture some of the pre-eclipse excitement. Unfortunately I am so excited during the eclipse, I lose my concentration when totality hits and forget to remove my solar filter from my camera’s telephoto lens, so all my photos of totality are black! This is perhaps the prettiest Total Solar Eclipse I have ever observed. 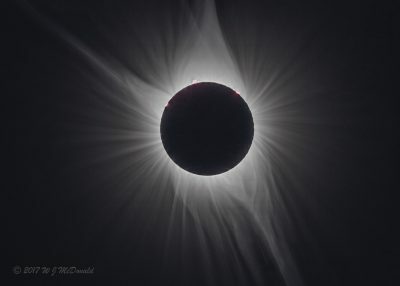 Viewing through my binoculars, there are spectacular Diamond Rings both as totality starts (C2) and as it ends (C3), and I there is a whole row of Bailey’s Beads, a good number of Solar Prominences, and the Sun’s corona has beautiful plasma streamers flowing off into space in several directions. The planet Venus shows itself near the Sun visually before totality, so I take a wide field photo with my iPhone to capture the moment. After we pack up our gear, our group goes to the Yeasty Beasty cafe in Monmouth for lunch. The cafe have eclipse-themed menus for both beer and entrees. After sharing our experiences and decompressing a bit, I say my goodbyes and start the drive north to my hotel in Newberg. Some of the group follow me north, however the Tesla in-vehicle navigation suddenly routes us off Highway 99W which I took this morning, and takes us over several back roads before joining the highway again at McMinnville Airport. My friends peel off before I reach the highway, since they have an AirB&B rented in this area. Once I rejoin the highway, I can see why the navigation redirected me over the back roads – the traffic on state highway 99W is at a near stand still. I creep along for the last 10 miles to Newberg, taking two more hours! I’m concerned I won’t have enough battery power in my Tesla Model S to make it, so I turn off the air conditioning and put the car in Econo Mode to save as much power as possible. It is hellishly hot this afternoon, reaching 36ºC on the highway as we all sit there. Needless to say, I’m exhausted by the time I reach my hotel, some three hours after leaving Monmouth, however my car arrives with a comfortable 50% charge level, so in hindsight I had nothing to worry about. This entry was posted in Oregon and tagged eclipse, solar eclipse. Bookmark the permalink.